As you may be aware, in 2007, the Ministry of Transportation began the Greater Toronto Area West Corridor Environmental Assessment (GTA West EA) to identify and address transportation needs in this area, with a focus on developing transportation projects. In December 2015, the Minister of Transportation suspended the GTA West EA, and the ministry committed to a review of the project with the assistance of an advisory panel. On February 9, 2018, after reviewing the advice of the panel, the Minister of Transportation announced that the province will not proceed with an environmental assessment for a proposed highway in the GTA West corridor. The news release of the announcement can be found at: https://news.ontario.ca/mto/en/2018/02/ontario-not-moving-forward-with-highway-for-gta-west-corridor.html. However, the Ministry of Transportation and the Independent Electricity System Operator (IESO), initiated a joint study to identify a smaller corridor that will be protected for future infrastructure needs, such as utilities, transit or other transportation options. The goal of the study is to ensure that lands are protected so that infrastructure required to support future growth and development in the region can be accommodated without more significant impacts to the environment and the Greenbelt. The study area for the new joint study is approximately one-third of the size of the area covered by the focused analysis area from GTA West EA, and will be protected as the study moves forward over the next 9-12 months. Information on the new study, including a map of the study area can be found at http://www.mto.gov.on.ca/english/publications/gta-west-report/north-west-gta-corridor.shtml. This study is not conducted as an environmental assessment, and any infrastructure development in the area would require the completion of an applicable environmental assessment. We noticed some media coverage of a City of Mississauga staff report on transit for our southerly neighbourhood. We enjoy reading transit reports and ones with maps. The main report is over 40 pages but the transit portion is just 13 of those pages so we’ve pulled them into a separate PDF. Download or view a copy here. There is an public Open House for the Waterloo Region ION LRT (#wrLRT) on Saturday April 8th. It’ll be a great chance to see what LRT looks like in an Ontario context. 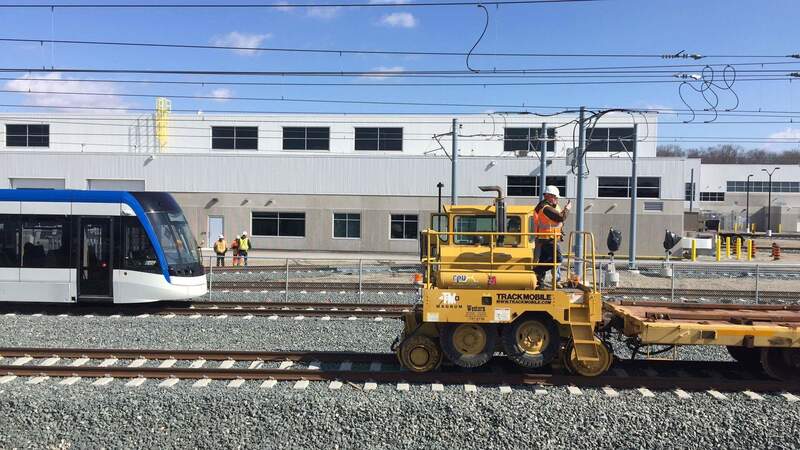 The first of fourteen Light Rail Vehicles (LRVs) will be on display. Exciting. We’ll be there!